Nastra remanufactures both semi-loaded and loaded calipers. Only original equipment type cores are used in the rebuilding process. All units are disassembled down to the casing to ensure a thorough cleaning. A steel shot blast is used to properly clean all castings. All casting bores and seal surfaces are tested and inspected before assembly to prevent leaking and ensure a proper fit. All threads are inspected and tapped. Only NEW bleeder screws are used. All steel pistons are tested and inspected for roundness, pitting and cracking. All good steel pistons are refurbished. All defective steel pistons are replaced with NEW ISO 9002 Certified steel pistons. All phenolic pistons are replaced with NEW O.E. ISO 9002 Certified phenolic pistons. All units are assembled with NEW ISO 9002 Certified rubber components that meet or exceed O.E. and S.A.E. standards and with the highest quality assembly fluid and silicone grease. All caliper ear hardware (rubber bushings and slider sleeves) is installed. 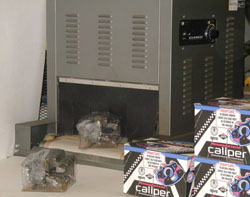 All units are tested after assembly and run through a quality assurance program. NEW copper washers are supplied. Hardware (bolts, clips, sleeves, springs and rubber components) is supplied and mounted where applicable. Brackets are supplied and mounted where applicable. Nastra Loaded Calipers include all of the above processes PLUS the addition of a premium semi-metallic OE grade friction. 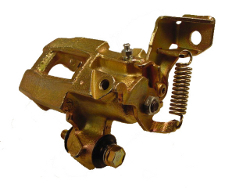 Loaded calipers are sold in pairs only to ensure matching friction for both sides of your vehicle. All of Nastra's calipers, both semi-loaded and loaded are individually shrink wrapped before boxing to ensure high quality and trouble free product.